It's the year 2140 and scientists have discovered the secret to everlasting life. Yes, you can now get Longevity drugs, a fabulous concoction that prevents disease and renews the body so that you can live forever! There's one catch. Of course the earth's resources are not unlimited. So in order to get Longevity drugs, you must sign the Declaration. And the Declaration says that you may not have children. But some people do have children. Anna is one of these children. They are considered Surplus, a drain on the limited resources of the planet. They are contained in dormitories where they are trained to be servants and menial laborers. To be absolutely obedient and to follow the orders of Legals. To hate their parents, the selfish people who created them. And suddenly Anna has a choice where she never had one before... Can she trust Peter? Could there really be a life for her on the outside? 1. 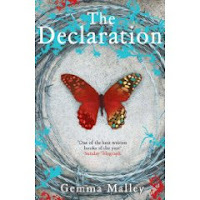 The premise is really interesting and the more you read, the more Gemma Malley fleshes everything out. Questions are answered along the way and everything fits together really tightly. And c'mon... who doesn't like dystopian worlds where children are illegal?? 3. The cover. Well... no, not the American cover which I actually don't like at all (hey, is that the same girl who's on the cover of Boy Proof? What do you think?). But the British cover is awesome and it actually incorporates information from the book. First is the hardcover and second is the paperback. Waaay better than the American cover, in my opinion. 4. Recommendability. Okay, so I made that word up. But still. I can think of a lot of popular books that would make great readalikes. Particularly Among the Hidden because it deals with very similar subject matter, but also Uglies (teens figuring out that their supposedly perfect world is, well, not quite) or The Adoration of Jenna Fox (just how far would you go to save a life [your own life?]). So. Yes. I liked it quite a bit. In fact, I am quite anxious to read the sequel (The Resistance... due out next week). 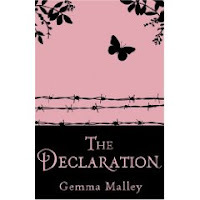 Read more reviews at Semicolon, Curled Up With a Good Kids' Book, Jen Robinson's Book Page, and Becky's Book Reviews. You make this book sound so exciting. I'm nabbing it off the shelf right now! You'll be pleased to know that I think that the sequel is actually stronger than the first book. I'm glad you liked this one.